Next week’s European parliamentary elections have turned into a showdown between Italian Prime Minister Matteo Renzi and the anti-establishment movement of comic Beppe Grillo that could decide the future of the government. The ballot on 25 May will be the first national election ever faced by the 39-year-old Renzi, who came to power in February after a party coup which forced out his predecessor, Enrico Letta. More than a vote about Europe, it is a test of his own political legitimacy and his ability to meet the challenge posed by Grillo’s proven appeal to an angry electorate disillusioned by recession, unemployment and rampant political corruption. Do well and he will be able to claim a mandate from voters for the ambitious economic and constitutional reforms he has promised, but so far not delivered. Do badly and his pledges to renew Italy and revive its sickly economy risk running into the sand, exposing him to attacks from an army of potential rivals inside and outside his centre-left Democratic Party (PD). Either way, the uneasy state of equilibrium which has held since he seized power in February to become Italy’s youngest prime minister is likely to be upset. Opinion polls give Renzi’s PD a healthy lead over rivals with a survey last week from the SWG institute published before a pre-election blackout giving the party 34.8% against 24% for Grillo’s 5-Star Movement and just 19.1% for Silvio Berlusconi’s Forza Italia party. But in Grillo, whose insurgent movement stunned Europe by winning 25% of the vote in last year’s general election, he has an opponent who has struck fear into conventional parties and many expect him to do better than the polls predict. A corruption scandal at the Milan Expo 2015 involving politicians linked to both the PD and Forza Italia and two separated mafia-related cases involving two of Berlusconi’s closest associates has given Grillo extra impetus. Grillo, who wants to reject European Union budget rules and hold a referendum on Italy’s future membership in the euro, has predicted his party will gain a clear victory. He says he will demand President Giorgio Napolitano asks him to replace Renzi’s cross-party coalition, originally formed after last year’s general election failed to leave a clear winner. “The key figures in this election are Renzi and Grillo,” said Maurizio Pessato, head of pollsters SWG who said one of the central questions of the election would be whether the 5-Star Movement will increase its tally. With Italy facing the risk of a return to recession after its economy contracted in the first quarter, the election is being closely watched in the rest of Europe for signs of a return to the chaos that marked the 2011 debt crisis. So far, despite ambitious announcements of tax cuts, labour reforms and sweeping changes to the system of government, many of Renzi’s promises have been held up by the difficulty of marshalling support both in his own party, where he has many enemies and among his coalition partners. Although he has often insisted he intends to govern until the next scheduled elections in 2018, there has been increasing speculation that he could at least consider a snap election either late this year or early next year, depending on the result of the 25 May European vote. While there are no firm plans, the idea would be to get a feeling for the mood of voters before deciding whether to seek a more solid majority without the need to rely on the small centre-right party which currently backs his government, according to a source close to Renzi. As the vote approaches, he has clearly singled out Grillo as his most dangerous rival, framing the vote as a choice between reform and blind protest likely to lead only to a return to the chaos threatened by the eurozone debt crisis of 2011. “We will save the country from prophets of doom and defeatists. If the government succeeds, Italy will succeed and if Italy succeeds, confidence will return to Europe,” he told supporters at a campaign rally on Saturday. For his part, Grillo mocks the smooth-faced prime minister as “Renzie”, a trendy, leather jacket-wearing fake no more in touch with real problems than Fonzie, the self-regarding character from the old TV show “Happy Days”. Their battle has achieved the unusual feat of pushing Silvio Berlusconi, the 77-year-old media tycoon who has dominated Italian politics for 20 years, into the shade. Berlusconi, struggling to contain party infighting and forced to serve a community service order for tax fraud that requires him to spend four hours a week at a home for Alzheimer’s patients, appears to have given up hope of attracting younger voters. His campaign pledges include free dentures, a guaranteed 1,000 euros a month for housewives and tax breaks for pet owners, an appeal to the animal-lover’s vote underpinned by repeated references to his girlfriend’s poodle Dudu. Grillo’s response was a cruel joke that Dudu should undergo vivisection and he was no more tender with Renzi whom he accused of being in thrall to German Chancellor Angela Merkel. “We’re not going to be like the little moron and go and kiss the German fat arse,” he roared to a packed campaign rally in Turin on Saturday. The 39-year-old Matteo Renzi, Italy's youngest prime minister, said radical steps were needed to revive an economy that has barely grown for the past 15 years and restore citizens' confidence in politics. 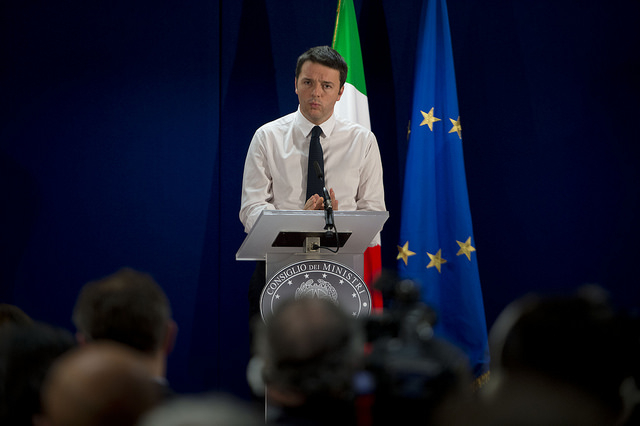 Renzi won a final parliamentary vote of confidence on 25 February after pledging to slash red tape and "revolutionise" the economy [read more].